The first mixed-use development in the west - Hillion Residences - was launched by property developer Sim Lian on Thursday. 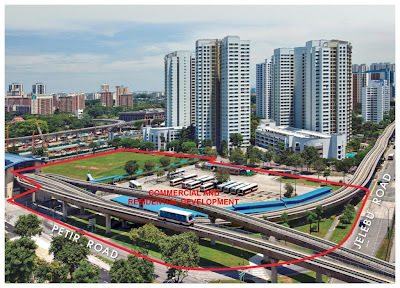 The 99-year leasehold private condominium in Bukit Panjang integrates residential living with a retail mall and an air-conditioned bus interchange. It will be also be linked to the existing LRT station and upcoming Bukit Panjang MRT station in 2015. The project consists of 546 units, comprising one- to four-bedroom units and penthouses across three residential blocks. A total of 250 units will be released for sale in Phase One, with a discount of up to 10% for the initial launch. Since its preview on Monday, 50% of these 250 units have been sold. The preview was open to business associates and buyers who registered their interest early. Sim Lian said prices start from $668,000 for a one-bedroom unit, $886,000 for a two-bedroom unit, $1,464,000 for a three-bedroom unit, $1,662,000 for a four-bedroom unit, and $2,780,000 for a penthouse unit. Executive director of Sim Lian Group, Kuik Sing Beng, believes that the development will be attractive to a diverse range of home buyers like "families and HDB-upgraders, singles and retirees seeking convenience and investors seeking to enhance the value of their property portfolio". Hillion Residences is expected to receive its Temporary Occupation Permit in September 2018. For those who are interested in the project, the sales gallery is located at Petir Road and is open from 10am to 7pm daily from today onwards. 2 comments to ''New project info: Hillion Residences"